Dead and dying strawberry plants with pallidosis-related decline in Santa Maria. 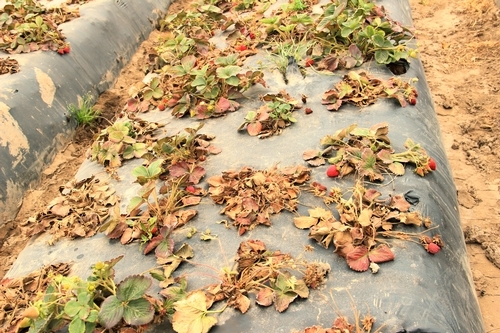 Pallidosis-related decline or pallidosis disease of strawberries is a viral disease that appeared in several fields in the Santa Maria area early this year. It is caused by a variety or viruses transmitted by insect vectors such as greenhouse whitefly, strawberry aphid, and thrips and other sources such as pollen, seed (not in the fruit production fields), and nematodes. In addition to the routinely present strawberry aphids and thrips, increasing populations of greenhouse whitefly in strawberry fields contribute to the spread of the disease. Severity of the symptoms varies depending on the strawberry cultivar, level of viral infection, and type of virus involved. Good agricultural practices to obtain clean transplants, maintain and promote plant health, monitor and manage insect vectors are important to address the disease issue. Since virus does not remain for too long in whiteflies, maintaining a host-free period of at least one month can reduce the risk of disease transmission by whiteflies which are occurring in large numbers in the recent years. Timely disposal of crop residue, avoiding second-year crop, and effective and timely management of whiteflies to prevent their spread to new plantings are among recommended practices to address pallidosis disease. Here is a short video to provide a quick overview of the disease.